People who know me know how important smell is to me. 'Duh, Jenny,' you say, 'smell is important to everyone.' Okay, but hear me out. Smell is SO important to me. A few days ago I filled out this What's Your Ideal Work Environment thing, and smell was the first thing I wrote down. Things have to smell GREAT. One of the best smells in the world to me is when something smells CLEAN. This is one reason I don't buy sausage (it stinks up the place), and when I buy bacon I pay more for the precooked bacon because it doesn't stink up the place as much. One of the highest compliments you can pay me is to tell me I smell good. I remember when my brother and sister-in-law walked into my house after months of not being here and said, "Yep, smells like clean laundry." Another time I was told, after living in my house for over 8 years, that it still smelled new. Recently I saw a friend I hadn't seen in a while and when he hugged me he said, "Oh, your smell! I remember your smell! Your clean clothes smell." AND, I kid you not, it's not uncommon for people to say to me after zumba class that they can't believe I smell like clean clothes after all that sweating. I promise, it's true. Have you heard of olfactory memory? How certain smells are closely tied to memories? I believe it. Different times of year I'll add different things to the mix. Like, from now until the end of the year, anything with the right blend of spices is perfect. 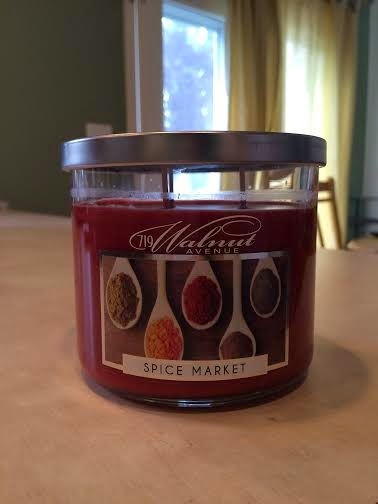 I really like this Spice Market candle from 719 Walnut Avenue. My kids are more into sweet smells, fruity smells. 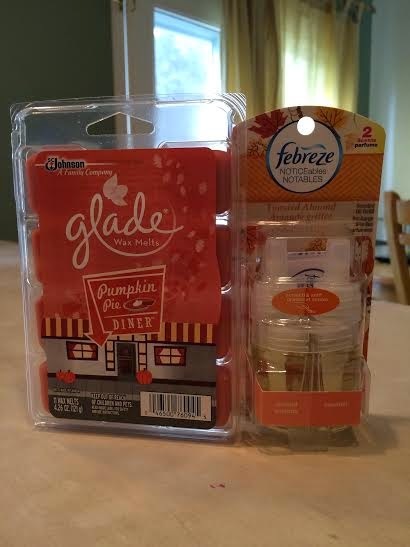 It's funny, it carries over for them, too-- my daughter is using these Pumpkin Pie Diner wax melts from Glade in her room. A holiday smell, but sweeter (too sweet for me, anyway). Another daughter likes to plug in Febreeze Noticeables in Toasted Almond (a blend of almond and caramel). I like the almond, but the caramel is too sweet for me (just right for her). What are your favorite smells? I'm not asking because that's what some bloggers do at the end of a posts, I really want to know. Do you know why you like those smells? Note: I was provided some product and compensation for this post. All content is original and honest. Those Downy Unstoppables in blue? I want that to be the smell of everything. I like the original Febreeze, too. 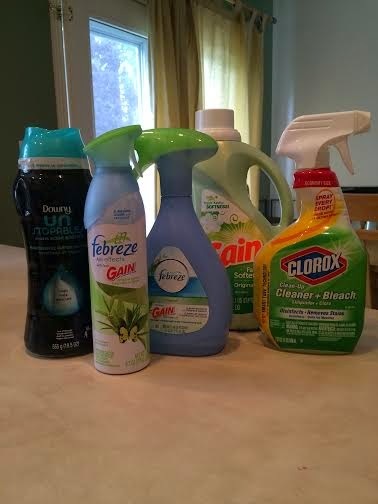 I prefer clean/breezy smelling things. I like that Method grapefruit smell as well. I do NOT like things that smell like almonds/sugar/caramel--things that are too sweet. I'm a little sad right now because the laundry detergent we used in Spain smelled so clean and amazing, but we don't have that brand here. I'm going to miss when things stop smelling like it. The new Pine-Sol? I don't know what's in it, but it smells amazing. Not like Pine-Sol.